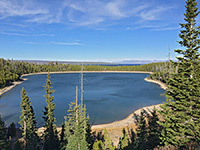 Two short paths start from the popular West Thumb Geyser Basin near the south entrance to Yellowstone National Park - the one mile Yellowstone Lake Overlook Trail and the half mile route to Duck Lake. 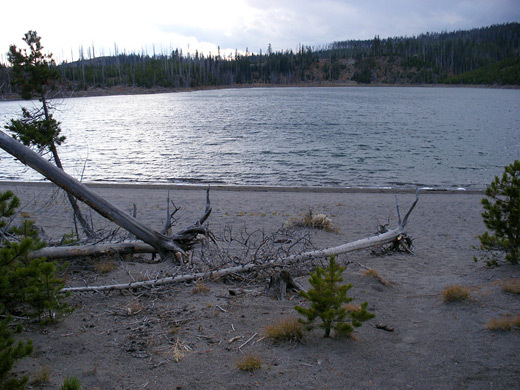 This encounters lodgepole pine forest recovering from the 1988 wildfires and leads to a sandy beach on the east shore of the small, quite scenic and peaceful lake, though as the main road passes right along the west edge, the place is often affected by traffic noise. The 37 acre lake occupies an ancient volcanic basin, formerly a hydrothermal explosion crater associated with the great Yellowstone caldera. Parking for the hike is the same as for that for West Thumb Geyser Basin, a quarter of a mile from the edge of Yellowstone Lake. The path starts just across the main road, passing through a thin belt of surviving old growth pines then entering the area burnt in 1988, which is now completely covered by small trees of varying heights up to around 20 feet. The route climbs fairly gently up the side of a low hill, and crosses a cleared area (course of a powerline) at the top, from where Duck Lake first comes into view, 100 feet below. The remainder of the trail descends to the shore, down a slightly steeper hillside and through more thick forest - the densely-growing trees at either side will need to be trimmed quite regularly to keep the path open. A few recently fallen dead trunks lie across the path, and the edge of the lake has a similar mixture of old logs and new growth. 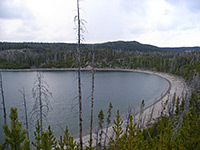 Although only 700 feet away, the much greater expanse of Yellowstone Lake is largely out of sight of the trail but can be seen from the hilltop by walking eastwards a short distance. The path to Duck Lake used to form one small part of the long distance Howard Eaton Trail, though one past the lake, the continuation route (to De Lacy Creek) is now largely obscured.